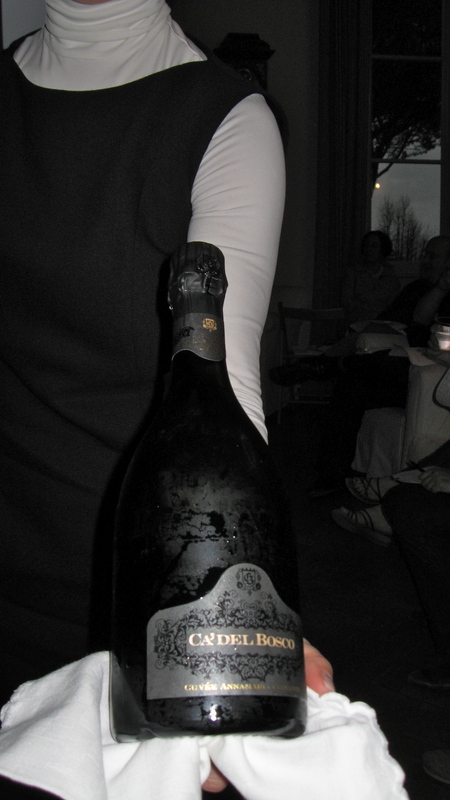 We began, again, with a spumante: Ca’ del Bosco Franciacorta Cuvée Anna Maria Clementi, 2002, named by the current owner for his mother, who founded Ca’ del Bosco, and containing a blend of chardonnay, pinot blanc and pinot noir. Having spent about six years in the bottle, it was zingy with minerals, fresh and chewy at once, and mouth-cleansing with its vibrant little bubbles. After a bit of bread with Pina’s homemade olive oil, we moved onto a dense white: Gravner Ribolla Anfora 2004. Pina led into this wine with its story—which is also the story of its winemaker Francesco Gravner. 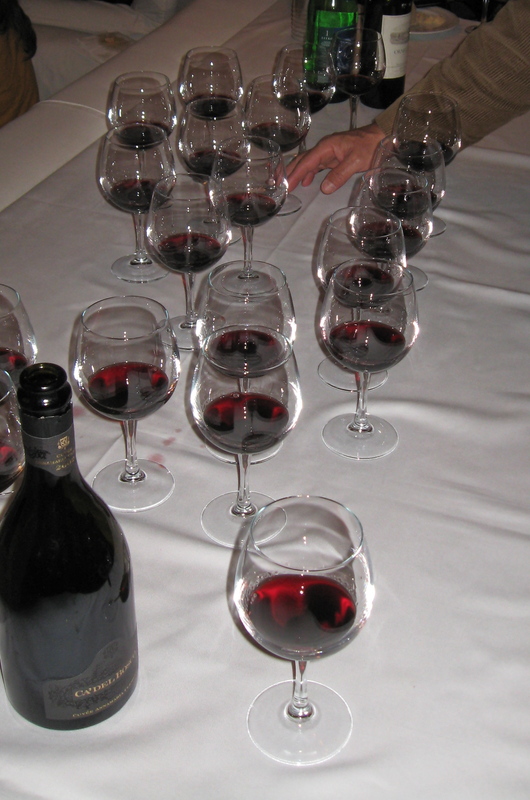 He had a successful high-production winery, and was making a nice income, but was dissatisfied. He went on a research trip to Georgia, where he tasted the local wine made in clay amphorae, the way the Greeks and Romans used to do it. He came back to his winery in the northeastern Italian Friuli-Venezia Giulia region, and began making wine in small batches, with only the best grapes, with the amphora method. The grapes are gently pressed with an ancient press, and the juice drips through a screen into the amphorae which are lined with beeswax and buried up to their necks in earth. The juice ferments for seven months underground, and is then decanted into large oak casks and aged for 36 months. Gravner only decants the wine into bottles during a waning moon, when the planets are properly aligned. This biodynamism comes through in the bouquet and flavor of this wine, which are vegetal, leathery, and earthy in the most interesting way. The color of the wine was a gold verging on amber, like a dessert wine, but it was bone dry. The next wine, which Leonard exclaimed was “a legendary, rare wine!” was my favorite, but I’ll never be able to buy a bottle because of what is referred to as a prohibitive pricetag: €120. 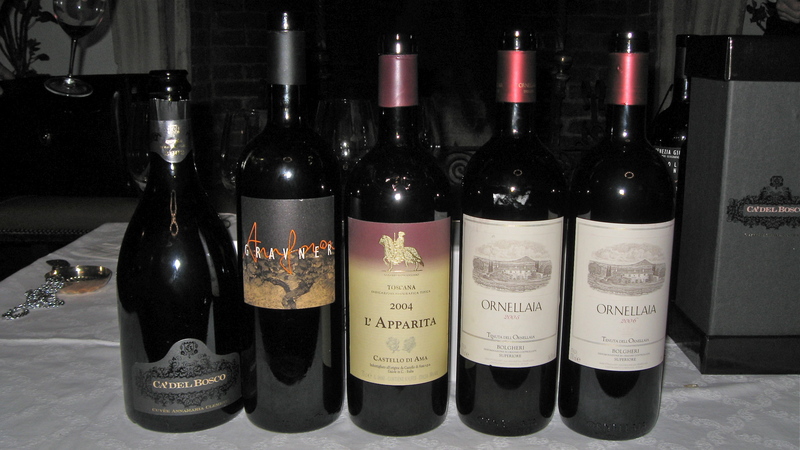 This was the “Super Tuscan” L’Apparita 2004 by Castello di Ama, made from 100% merlot. This is a wine that has me bowing down in worship before this much-used, much-maligned grape. Its color was like a ruby, its bouquet full of leather, dark chocolate, earth, bread baking, sweat, spice, and wood—“sandalwood,” said Pina. The taste created different sensations all over the mouth, but what made me close my eyes was the anise that lingered in a long, delicate line. While we sipped and swirled in awed silence, Gianni, Pina’s partner in life and wine, poured out little sips of the two final wines: Bolgheri Superiore Ornellaia 2005 and 2006, Bordeaux-blend Super Tuscans. They were both completely their own wines. The 2005 was nuttier, both were complex, but Pina seemed most inspired by the 2006, in which she smelled pine and salty sea spray.